If this is the first tutorial you're reading in this series, then I highly recommend catching up with what we've covered thus far. Essentially, you're coming in at the end of the show. At this point, we've laid the foundation for our plugin, written the plugin, and defined and explored namespaces and autoloaders. All that's left is to apply what we've learned. So in this tutorial, we're going to put all of the pieces together. Specifically, we're going to revisit the source code of our plugin, namespace all relevant classes, and write an autoloader so that we can remove all of our include statements. I'll discuss everything in detail as we work through the code. Again, if this is the first tutorial you're reading in this series, catch up with what we've covered so far and then return to this tutorial. You're also going to need a copy of the source code of the plugin with which we're working. You can grab a copy of it right here. Assuming it's installed, activated, and you've got your IDE running, let's get started. Note that if you've set up your plugin differently, that's fine. Your namespaces will likely be different, but that shouldn't affect anything that's covered in this series. Using the directory structure as a guideline, let's go through all of the PHP files that make up our plugin and define their namespaces. Doing this is easy: It's simply a matter of using the namespace keyword and placing a qualified name at the top of each file. I'll list each one below. * a function that starts the plugin. * Description:       Learn how to use Namespaces and Autoloading in WordPress. // If this file is accessed directory, then abort. * Represents a meta box to be displayed within the 'Add New Post' page. * to which this display belongs. The root namespace is Tutsplus_Namespace_Demo, which corresponds to the directory name of the plugin. The rest of the namespaces such as Tutsplus_Namespace_Demo\Admin and Tutsplus_Namespace_Demo\Admin\Util also correspond to their respective directories; however, the directory names are cased (versus being in lowercase). Or you may see any number of other similar error messages. That's okay. It's normal. But it raises the question: What's up with our plugin? Luckily, nothing. This is expected behavior. The first message that you see may be a result of another plugin that you have installed. I was unable to reproduce it on its own; however, when I deactivate a few of the other plugins I have running, the plugin generated the second message (which is the message I wanted to demonstrate). When you namespace code, PHP expects to locate a class within a given namespace. Conceptually you can think of your classes now belonging to their own package (or subpackage) or however you define it. And in order for a function to access a class within a package, it needs to be made aware of the packages that exist. This is where additional namespace functionality and autoloading comes into play. So before we go about trying to access our code via their namespaces, let's work on an autoloader. Don't let the name spl_autoload_register intimidate you. It simply means that this is a function that's part of the "Standard PHP Library" and it's how we "register" an "autoload" function. It's a mouthful to say and a lot of characters to write, but it's just a function that we're going to use to tell PHP how to parse namespaces and class names and where it can find our files. This function is what allows us to write our own custom code for autoloading files and then hooking said function into PHP. That is, we're going to be telling PHP where to find our files and how to parse namespaces, file names, and so on so that it will include the files. With all of that said, we're ready to actually write an autoloader. When writing an autoloader, the thing to keep in mind is how our files are organized. That is, we want to know how to map our namespaces to our directories. In the example we're using, it's simple: The namespaces are cased versions of the directory structure. This is not always true for other projects; however, it's yet another reason why I like to logically organize my files based on their physical location. Split the namespace up based on the slashes. Split the package and the subpackages up based on underscores and replace them with hyphens (if necessary). Know how to map class names, interfaces, and so on to file names. Create a string representation of the filename based on the above information. With all of those points made, we've got our work cut out for us. 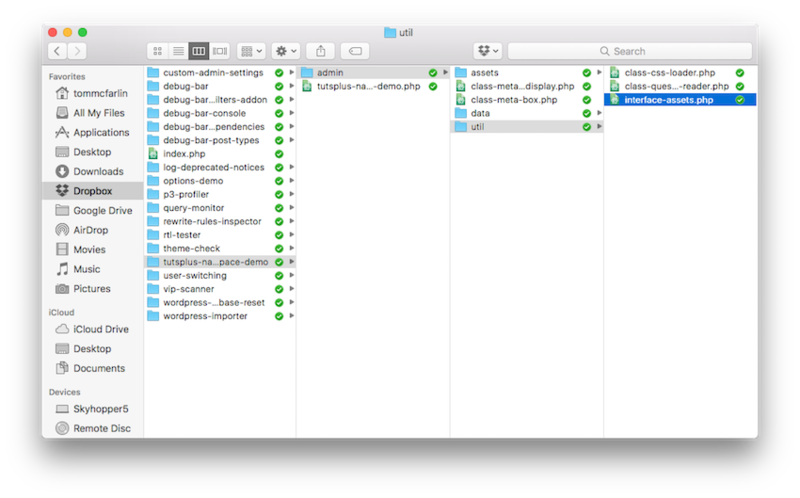 In the plugin directory, create a subdirectory called inc, and in the inc directory create a file called autoload.php. * plugin by looking at the $class_name parameter being passed as an argument. * will then build a file to the path based on the namespace. * The namespaces in this plugin map to the paths in the directory structure. * @param string $class_name The fully-qualified name of the class to load. // If the specified $class_name does not include our namespace, duck out. Obviously, this isn't doing anything yet. Note that I'm going to be writing the code and code comments to thoroughly explain what we're doing. If you're just venturing into this on your own for the first time, writing an autoloader along with using namespaces and working with files might be a bit frustrating. This is where a debugger and using log files can come in handy. This is outside the scope of this tutorial, but know that writing an autoloader is not something that you may get right the first time you're doing it. Let's start adding some functionality given the steps listed at the beginning of this section. First, we need to set up a loop that's going to iterate backwards through the parts of the filename that are passed into the autoloading function. 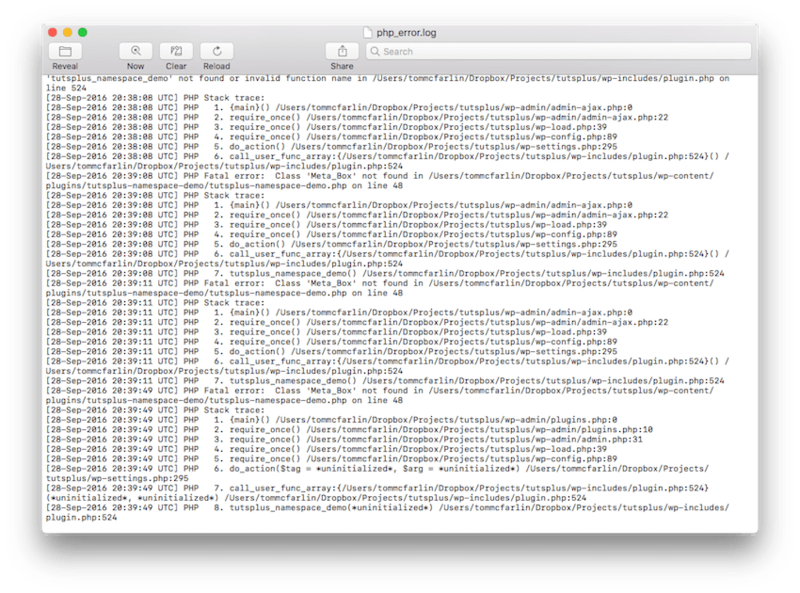 We do this because it makes it easier to build a path to the file to autoload. // Split the class name into an array to read the namespace and class. // Do a reverse loop through $file_parts to build the path to the file. After this, we need to look at the $file_parts and replace all occurrences of the underscore with a hyphen because all of our class names and interface use underscores whereas our filenames use hyphens. // Read the current component of the file part. Next, we're going to need a conditional that does a few things. It needs to check to see which entry of the path of the filename that we're reading. If we're on the first entry, then we're at the file name; otherwise, we are at its namespace. Next, if we're reading the first entry, we need to determine if we're trying to autoload an interface or we're loading a class. If it's the former, then we need to adjust the name of the interface so we load it properly based on its filename; otherwise, we'll load the class based on the value in the $current variable. // If we're at the first entry, then we're at the filename. * define the $file_name differently so that it's properly loaded. // Grab the name of the interface from its qualified name. // Now build a path to the file using mapping to the file location. // If the file exists in the specified path, then include it. And at this point, we have a full autoloader (which can be retrieved by downloading the files from the link in the sidebar of this post as the source code would be a bit long to post here in the tutorial). Finally, it's important to note that this particular function could (or should) be rewritten as a class. Furthermore, the class should consist of several smaller functions of which are testable, have a single responsibility, and read more clearly than what's above. Perhaps in a bonus tutorial, I'll walk through the process of what that would look like. // Include the files for rendering the display. // Include the autoloader so we can dynamically include the rest of the classes. To be clear, we're replacing it with our autoloader. At this point, we should be done with our plugin. Now that we've namespaced our code to provide a logical organization of related classes, and written an autoloader to automatically include files based on each class's namespace and file location, we should be able to start our plugin and have it run exactly as it did during the first successful iteration. The last thing we need to do is make sure that we update the bootstrap file so that we instruct PHP to use the namespaces for the Meta_Box, Meta_Box_Display, the Question_Reader, and the CSS_Loader. * sets the plugin in motion. The use keyword must be declared in the outermost scope of a file (the global scope) or inside namespace declarations. This is because the importing is done at compile time and not runtime, so it cannot be block scoped. If so, then congratulations. You've successfully set up your plugin to your namespaces and autoloading. If not, double-check the code against what we've shared here, review your error logs, and make sure nothing is showing up out of the ordinary in the WordPress administration screen. If you do see something, odds are it has to do with something minor. Review the code we've covered, compare it to what's attached here to this post (in the sidebar along with the large blue button), and see if you can narrow down the issue. 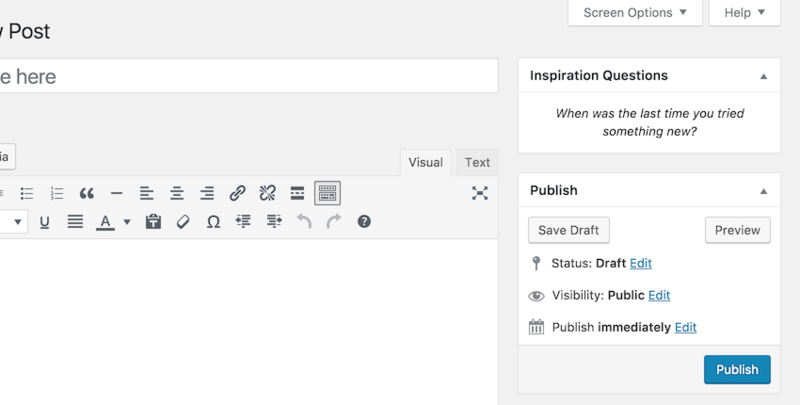 We've built a plugin that prompts users with questions to help kickstart their blogging. We've used PHP functions for reading files from the filesystem and rendering it in the display. We've defined namespaces and autoloading, and taken a look at how they can be applied. We've organized our code and written our own autoloader, making the code more readable, organized, and less cluttered. Ultimately, a lot of the material covered throughout this series can be used in existing and future projects on which you may be working. Remember that you can also find other WordPress-related products in our marketplace. And if you want to learn more about developing solutions for WordPress, you can find all of my tutorials and series on my profile page. Don't hesitate to follow me on my blog or on Twitter as I discuss software development in the context of WordPress almost daily. And remember, the link is for downloading the final source code is in the sidebar under a button titled Download Attachment. Of course, don't hesitate to ask any questions in the comments!